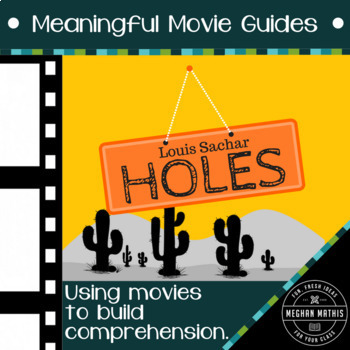 Searching for a way to show your students the fantastic film based on Louis Sachar's novel, "Holes," while still keeping them on-track and learning? This wonderful resource keeps students focused on learning while still enjoying the movie. The worksheet includes 25 questions: multiple-choice, fill-in-the-blank, and short answer that cover major events, plot points, and characters in the movie from beginning to end. 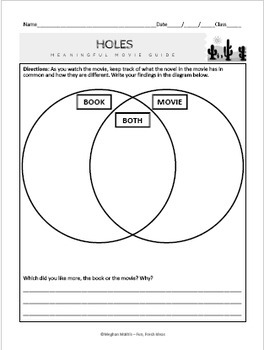 Additionally, this download also includes a venn diagram that asks students to consider how the movie differs from the novel, as well as what it has in common. An awesome tool for making sure students are paying attention and to assess their comprehension. What's Included with this Resource? What People are Saying About Meaningful Movie Guides! • "This movie guide is definitely meaningful! This guide kept my students engaged while watching the movie. My students loved reading this book and they also loved watching the movie too. There were a lot of difference between the book and movie to this guide helped them differentiate between the two." • "Perfect for 5th grade use along with the movie after reading the novel." • "I loved this it gave watching the movie a whole new purpose." Looking for more Meaningful Movie Guides? Did you know that you can receive credit towards future TpT purchases by reviewing this resource? If you enjoy this resource, please leave a review at the product page or through “My Purchases” under “My Account” at TpT. You can also follow me for the latest news on new resources and upcoming sales! As always, if you are displeased with this product for any reason, please contact me so I can make it right!